As technology traits in corn seed increase seed prices and the price received per bushel increases, it is wise to consider black cutworm management in corn. Many areas of Iowa were cool and wet last spring, 2008. That weather often delayed planting and created flooded areas that had to be replanted. These conditions may have caused black cutworms to be more common than usual. Producers this spring must consider the economics — higher seed corn prices and high grain prices, and the environmental factors — recent rains that may delay some planting and the presence of winter annual weeds, when deciding how to manage black cutworm. Some producers are asking, "Should I add insecticide to my herbicide to attempt to prevent an infestation, or should I spend time scouting the corn fields and treat only those that have the insect? I am applying the herbicide so there is no additional application cost and saving one bushel of corn is likely to pay for the insecticide." A sound premise of pest management is to purchase and apply controls only when necessary. Preventive treatments are generally not warranted unless there is reason, usually from past experience that the pest is likely to be present and there are no curative controls available. A black cutworm larvae on soil. With the black cutworm, however, the infestations are sporadic and uncertain. Also there are sampling techniques for the larva, treatment thresholds, and therapeutic control options for this pest. With the therapeutic management options it would make more sense to watch for cutworm infestations and apply insecticides when they are present. An example, you are planting 1,000 acres of corn and, based on past experience, it is probable that you will have 10 percent infested with cutworms. If you purchase insecticide at $4 per acre and treat all of the fields, the cost would be $4000. If you scouted the fields and treated the 10 percent infested, assuming there is a treatment cost for the insecticide and its application of $12 per acre, the cost to you would be only $1200. But the catch is you must scout all those fields carefully to find the cutworms before economic losses occur. Can you picture this field in your mind? A low-lying field; could be in the flood plain of a stream or river. It is poorly drained so it takes time in the spring to dry and consequently is planted later. With the soybeans there the previous year there was no fall tillage. Now there is a good crop of winter annuals present that are getting ready to flower. If you have cutworm infestations, it is frequently in those types of fields. 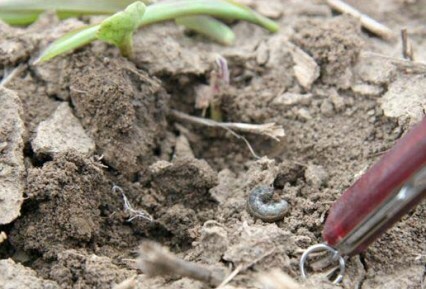 Where should you start your scouting to detect cutworms? Wouldn't these be the fields? Don't forget to check the rest of the fields if you find infestations in the "sentinel" fields. • If cutworms are longer, treatment should be applied if 5 percent of the plants are cut. If the field has a poor plant population, (20,000 or less) these thresholds should be lowered. Jon Tollefson is a professor of entomology with extension and research responsibilities. Tollefson can be reached at (515) 294-8044 or by emailing tolly@iastate.ed . Links to this article are strongly encouraged, and this article may be republished without further permission if published as written and if credit is given to the author, Integrated Crop Management News, and Iowa State University Extension and Outreach. If this article is to be used in any other manner, permission from the author is required. This article was originally published on April 28, 2009. The information contained within may not be the most current and accurate depending on when it is accessed.